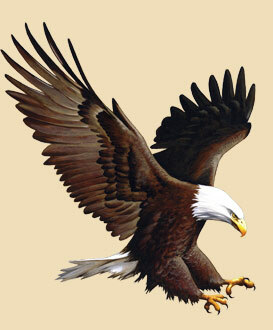 The bald eagle has the freedom to soar through the sky and perch amongst the highest peaks. It is no wonder the eagle became a national symbol of the United States. With acute eyesight and swift flying ability, the Bald Eagle (Haliaeetus leucocephalus) is a magnificent bird of prey unique to North America. 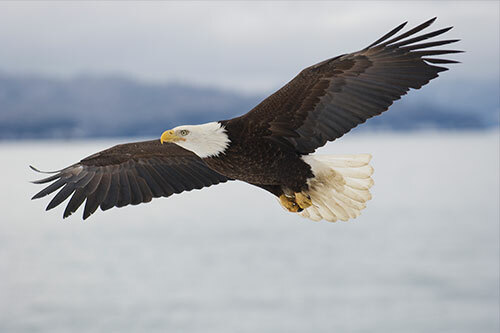 American Expedition is proud to present Information, Facts & Trivia, and Photos of the Bald Eagle, as well as an examination of the Bald Eagle's place in United States history. Adult bald eagles, both male and female, have a distinctive white head and tail, and a body and wings of a dark brown color. Their beak and feet are bright yellow. The average size of a full grown eagle is 30 to 32 inches tall, and has a wingspan measuring six to seven feet. Male bald eagles weigh between 7 and 10 pounds, with females being considerably larger, and weighing up to 14 pounds. Young eagles, or “eaglets,” have plumage that is brown and speckled with white, and have a dark brownish-black beak. The eagle will not develop a distinguished white head and tail until they are 4 to 5 years old. 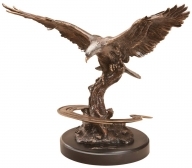 Looking for gift ideas for eagle lovers? 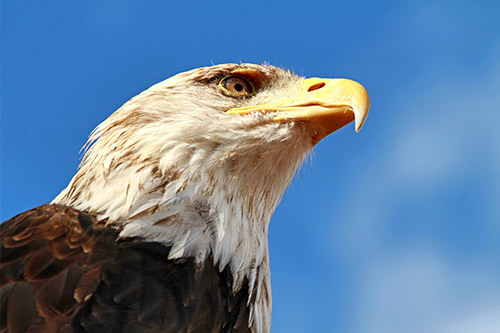 Find unique Bald Eagle Gifts & Decor in our wildlife store. 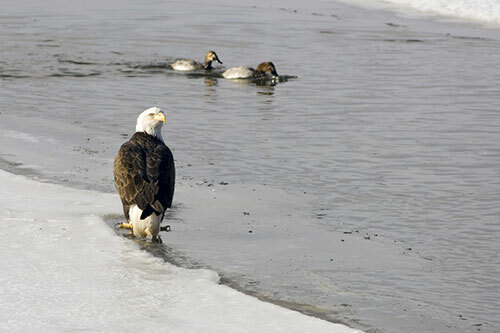 Bald Eagles are a monogamous bird, which means they stay with the same mate their entire life. If either bird happens to die, the eagle will find a new mate. Every mating season, which occurs anywhere from late September to early April (depending on the region), the female eagle will lay one to three eggs. She lays the eggs about five to ten days after mating. Both sexes take turns incubating the eggs for 32 to 35 days until they hatch. After the eaglets have hatched, the young will remain in the nest for 10 to 12 weeks while both parents share the responsibility of feeding them. After they have learned to fly and hunt, the eaglets leave the nest. However, disease, starvation, bad weather, and predation cause more than 50% of eagles to perish during their first year. If the eagle survives, it can live about 20 to 30 years in the wild. 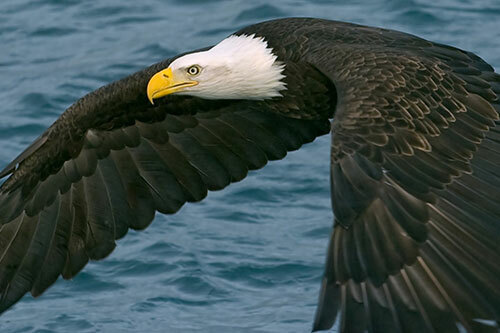 Bald eagles have tremendous eyesight with a visual acuity six times better than that of humans. They are capable of seeing over 1-1/2 miles away. This exceptional vision, along with their long, sharp talons, make them very effective predators. An eagle will make screeching sounds to warn predators not to venture into their territory. This noise is also used to deepen the bond between the male and female. Bald eagles primarily eat fish and carrion, but they also eat ducks, snakes, other small birds, reptiles, and small mammals. Bald eagles have even been known to kill young deer and adult raccoons. Male bald eagles weigh between 7 and 10 pounds. Females are considerably larger, weighing up to 14 pounds. Eaglets and juvenile bald eagles are brown in color, with some white feathers. They do not get the distinct coloration of a mature bald eagle until they are about 4-6 years old. Bald eagles are capable of carrying a little more than half their own weight in flight, up to 8 pounds. 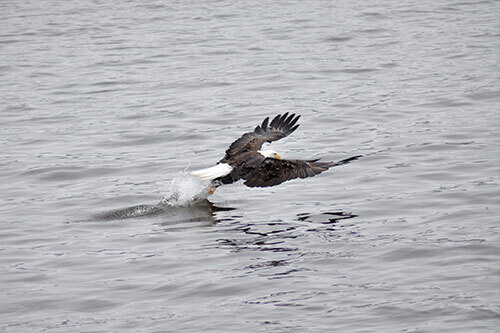 Bald eagles are exceptional swimmers. If they catch a fish which is too big for them to carry in flight, they will swim with it to the shore. Bald eagles require old-growth forests of coniferous or hardwood trees for perching, roosting, and nesting. They will often build their nests in trees that have good visibility of a nearby waterway. Most bald eagle fatalities are either directly or indirectly human related. Common causes of death are trauma cause by impact with man-made structures, gunshot, poisoning, trapping, and electrocution. In the mid-20th century, bald eagles numbers severely dropped due in part to the use of the pesticide DDT. DDT interfered with the bald eagle's calcium metabolism, which made eggshells too brittle to withstand the weight of a brooding adult. After Bald eagles were protected through the Endangered Species Act of 1966, and DDT was banned in 1972, bald eagle numbers dramatically shot up. In 2007, the bald eagle was removed from the list of protected and endangered species. In addition to being the national bird of the United States, the bald eagle is seen as sacred in many Native American cultures. Many are considered messengers of the Gods, and eagle feathers are often used in ceremonial costumes and headdresses. 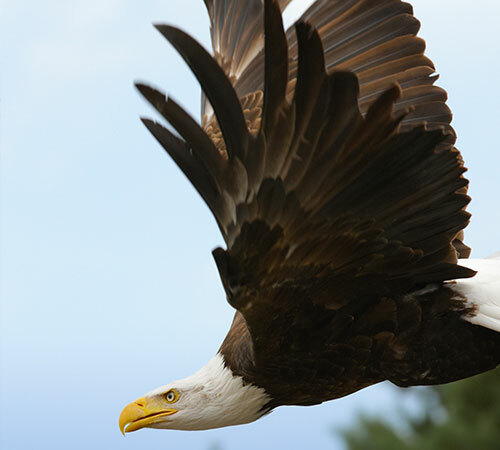 Bald eagles fly at a speed of around 30 miles per hour, and while gliding can reach up to 45 miles per hour. When diving, they can reach speeds of up to 100 miles per hour. An adult bald eagle’s 2 inch long talons are capable of exerting a force of 1,000 pounds of pressure per square inch. Bald eagles have up to 7000 feathers which are composed of keratin, the same material which makes up human hair and nails. 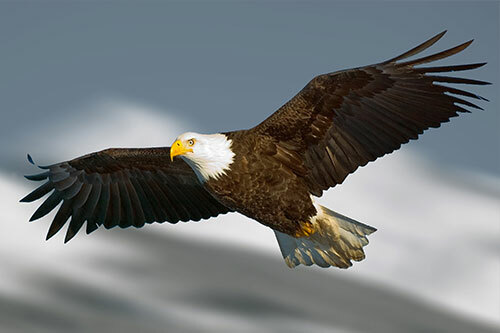 An eagle can fly up to 10,000 feet. Bald Eagle numbers have made a comeback in recent years, and on June 28, 2007 the Department of the Interior took the Bald Eagle off the Endangered Species List. The bald eagle's eyesight is estimated to be 5 to 6 times sharper than a human's. Adapted as national bird of the United States on June 20th, 1782. An eagle can consume one pound of fish in about four minutes. Bald eagles are found only on the continent of North America. They prefer to inhabit areas near large, open bodies of water such as lakes, rivers, wetlands, and ocean coasts. By living near water, they can easily find food. Eagles will migrate in order to find temperate environments. In northern regions, they will travel south in the winter to avoid the chill. In southern regions, they will migrate northwards to escape extreme heat. Eagles build large nests in the forks of tall trees or along cliff faces. They return to the same nesting site each year, adding new materials to the previous year’s nest. A bald eagle’s nest can reach ten feet across and weigh up to 2,000 pounds. In 1776, the eagle began to appear on coins in the United States. On June 20th, 1782, the bald eagle appeared on the Great Seal of the U.S. and became the national bird. In 1782, there were about 100,000 nesting eagles in North America. The topic of what the national emblem of the United States of America should be was disputed over for more than six years. Benjamin Franklin was a prominent opponent of the bald eagle being chosen as the national bird of the United States. In a letter to his daughter, Franklin wrote that the bald eagle was a "a bird of bad moral character. He does not get his living honestly." Franklin thought that because the Bald Eagle robbed other birds of their prey, and because the eagle would flee instead of fight when mobbed by sparrows, that the bird was a poor choice. He wrote that the wild turkey, another bird native to North America, would have been more representative of the United States, because although the turkey was a little vain and silly, it was a bird of courage, because the turkey would not hesitate to attack British troops that invaded his farm yard with a red coat on. In 1789 Congress chose the bald eagle to represent the nation, and since then it has been the national emblem of the country. It was chosen as the national bird of the U.S. because of its majestic beauty, strength, grace, long life, spirit of independence, and loyalty. It was also chosen because it is native to North America. 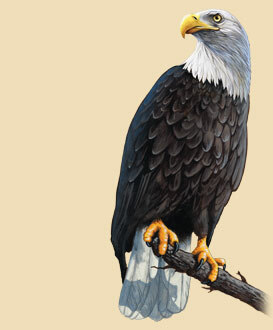 Shop for bald eagle gifts in our wildlife store. In this video, eagles are show swooping down on water for fish and grabbing them with their sharp talons. The bald eagle's eyesight is estimated to be 5 to 6 times sharper than that of a human. They are capable of seeing over 1-1/2 miles away. The wingspan of a bald eagle can range between 6-8 feet. Eagles are known as “birds of prey,” meaning they hunt for their own food. They sit on a perch or fly over the surface of the water looking for fish. An adult bald eagle’s talons are 2 inches long and are capable of exerting a force of 1,000 pounds of pressure per square inch. 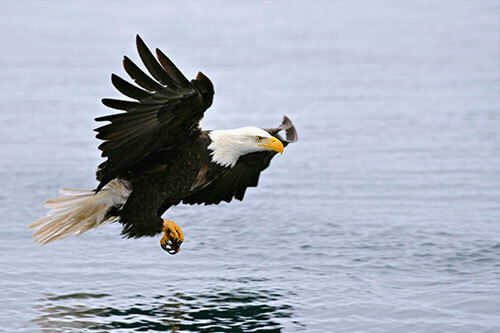 Upon spotting a fish, the eagle will swoop down and grab it with their sharp talons. If it is small enough, they will eat it when flying; if not they will bring it back to the nest. A bald eagle can fly at a speed of around 30 miles per hour, glide at the speed of about 45 miles per hour, and dive at a speed of up to 100 miles per hour. The bald eagle is sacred in many Native American cultures. Eagle feathers are often used in ceremonial costumes and headdresses. 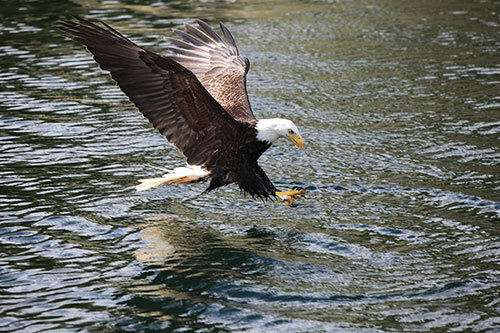 The diet of a bald eagle consists of fish, carrion, small mammals, snakes, reptiles, gulls, small birds, and ducks. 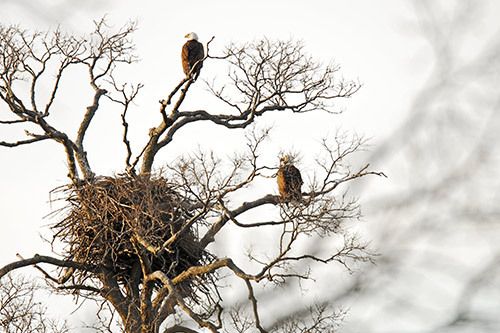 Bald eagles try to build their nests where trees fork into branches. They try to pick large trees that overlook bodies of water. The average nest in 5 feet in diameter, but larger nests can measure 9 feet across and weigh up to 2,000 pounds. In some areas where trees are scarce, bald eagles will actually build their nests on the ground. 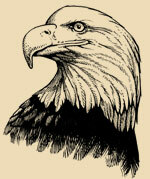 Interested in Bald Eagle Gifts & Decor? Visit the section of our wildlife store!